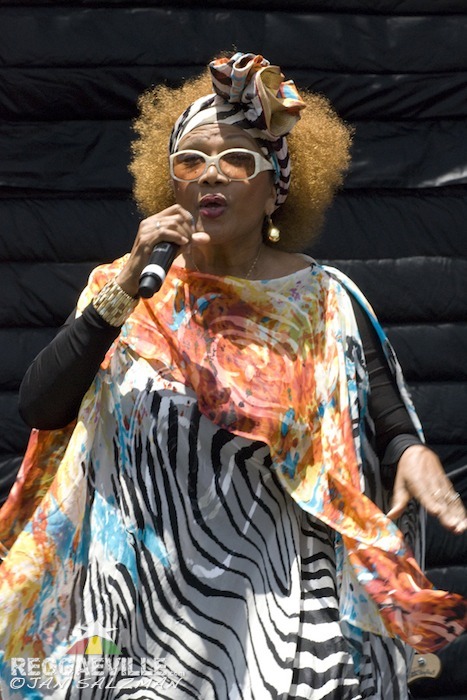 The 27th annual UCLA Jazz Reggae Festival buttressed its Memorial Day headliner Ziggy Marley with a full slate of mostly classic artists including Marcia Griffiths, Mr. Vegas, and Barrington Levy. Not quite a sell-out, the many thousands in attendance enjoyed mostly warm temperatures throughout the afternoon, spreading beach blankets across the university’s recreational field. With a long day of riddims on tap, it was best to get comfortable. Appropriate for its collegiate setting, Mr. Vegas brought his bounce and bash dancehall, running a history of island music class in the process. With a song list that mostly drew from his latest Sweet Jamaica album, itself a collection of ska, rocksteady, roots and more, the charismatic singer left nearly a breath to be drawn on Do You Know and Give Me a Light. Citing Damian Marley’s Welcome to Jamrock, Vegas demonstrated his versatility of song and voice, singing the title track with a tenderness that played well in his middle of the line-up moment. Nods to Jimmy Cliff and Toots didn’t go unnoticed by the slightly aging contingent, bringing back the frontman for a quick encore. Backing Vegas, and his successor to the stage Barrington Levy, was the LA-based outfit Detour Posse who did much to anchor the Lover’s Rock renegade. While his choices of repertoire were desirable, if expected, Levy seemed determined to engage his followers in a lot of call and response and divided singing competition. Throughout gems like Prison Oval Rock and Under Me Sensi, his polling the audience with the query “Are you sleeping?” felt less and less rhetorical and evocative each time around. Replaced later by another question, this time, “Can I go home now?” Levy’s set culminated with Love the Way She Love, during which he was joined by Mr. Vegas in a rousing send-off. Ziggy Marley’s 90-minute set opened rather gently with Family Time, leading into a trio of cannabis-flavored numbers Wild and Free, Kaya, and deep album track Melancholy Mood. 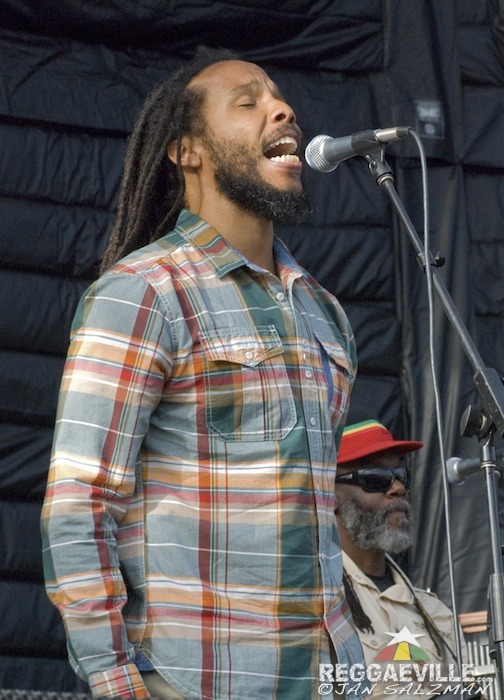 Perhaps sensing the impending curfew and duration of the festival to this point, the reggae superstar spent little if any time talking to the crowd, instead channeling his energy through Personal Revolution and Let Jah Will Be Done. Peppering the show with his father’s influence on Africa Unite and segueing Get Up, Stand Up and War into his own Justice, Marley’s segment focused otherwise entirely on his solo catalog, avoiding the hits of his Melody Makers days. Sneaking in Changes just under the closing bell, scion Daniel Bambaata reprised his role on the studio version on-stage for a familial finale. As the sun set on the campus grounds, UCLA’s day of reggae completed both a bookend to another year of schooling for its host as well as an unofficial kick-off to summer. Taking in the much-deserved applause from the thousands of tanned and tired, the dozens of students responsible for the planning, preparation, and performance schedule smiled and waved from the stage, content they had once again pulled off a fantastic weekend. Yes, you can go home now.